An ancient working breed, the Samoyed is very close to the primitive dog ??? no mixture of wolf or fox runs through the breed?۪s gene pool. He was developed by the Samoyed people of Siberia. They used the dogs for herding reindeer, hunting and hauling sledges as well as guard work. The breed was cherished by these people ??? they even allowed them to sleep in their tents ??? because they depended on the dogs for their survival. Intelligent, gentle and loyal, Samoyeds enjoy being with their families. Due to their working heritage, they may chase things, run and bark, so it?۪s best to channel that energy into some kind of job or activity. Otherwise, these independent thinkers may invent ways to keep themselves entertained. At the very least, daily exercise is necessary. The Samoyed coat can also mat and needs to be brushed weekly, more often during shedding season. Ranging in size from 19 to 23?_ inches tall at the shoulder. 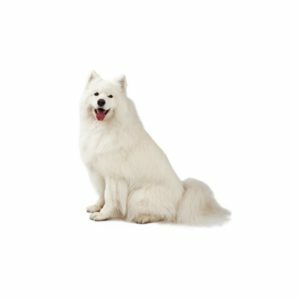 Are you interested in purchasing a Samoyed?